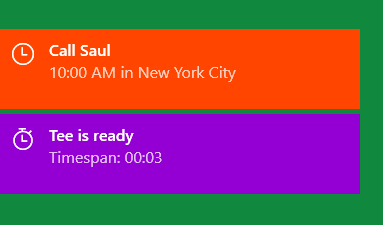 Alarms show an elegant, unobtrusive notification banner when due, which comes sliding in from the border, similar to the standard Windows notifications. You can also filter the alarm list for "Next Month" (the default), "Next Hour" and "Next Year". 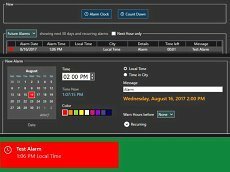 Click the Alarm Clock button in the alarm center, to begin entering a new single alarm. Select the date of your alarm in the calendar (default is the current day) and the time in the time picker. Optionally you can edit the message text, select the color of the notification popup and set a sound signal in the Action part of the dialog (Sound, Sound Loop or Speak Text). Click Add Alarm and the alarm is set. 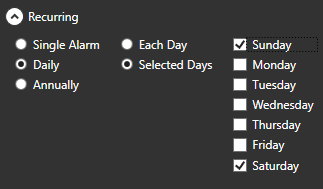 If you decide you want to delete the alarm, select it in the list and click the waste bin icon in the upper group box or right-click the menu item and select Remove Alarm. If you want to change features of an alarm, select it and click the pen (edit) icon or right-click the menu item and select Edit Alarm. After editing, click the Update button and the changed alarm is saved. If the alarm time is supposed to be the local time in another city and time zone, select Time in City instead of the default Local Time. You are then able to select the city of the desired timezone in a combobox. Notice that only cities are displayed, for which you have created or edited clocks in the program. If you need a city not in that list, create or edit a clock for that city. For single alarms you can also optionally select a number for Warn Hours before. If for instance you have set an alarm at 8:00 p.m. you can set it to "1", so you will be notified at 7:00 p.m. as well. Daily alarms repeat an alarm each day at a given time or only on selected weekdays. For instance you can show a reminder each working day at 5 p.m. to remind you of quitting time or each Friday or only on weekends (Saturday and Sunday). Annual alarms show an alarm on a certain date each year, like for birthdays or other anniversaries. These alarms can also optionally show a separate reminder 1..10 days before the actual day, in order to do preparations (for instance buy a gift or write a letter). Set a Count-Down Alarm when you want to be notified after a certain timespan has elapsed. Click the Count Down button in the alarm center, to begin entering a new count-down alarm. Optionally you can enter a text message, select the color for the notification popup and set a sound signal (Sound, Sound Loop or Speak Text). Click Add Count Down to start the count down. You can play a sound signal every hour or every quarter-hour or hear the time spoken with a computer voice. To select chimes, open the Chime tab in the alarm center dialog. Hourly - the sound signal on the (full) hour. Once plays the sound signal once, while 1..12 times plays it multiple times, depending on the current time. At 5 p.m. or 5 a.m. it will play 5 times for instance. It is recommended to use a low-pitched gong sound like bell1.mp3 in the sound collection. Quarter-Hourly - the sound signal on the quarter-hour. Once plays the sound signal once, while 1..3 times plays it multiple times: once on 15 minutes past the hour, twice on 30 minutes and three times on 45 minutes. It is recommended to use a higher-pitched gong sound like bell3.mp3 in the sound collection. Speak Time - the option to hear the spoken time. Windows usually comes with an English computer voice (Zira Desktop) and another voice for the system language (if not Englisch). You can either use the default English voice or another voice. In that case you should also modify the text of the spoken time in the Extended Options. 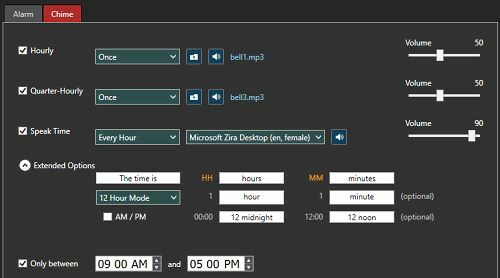 With the option Only between you can set a limiting time frame for the chimes, so you will not be disturbed during the night. The volume for each sound signal can be adjusted separately.